MONTREAL -- Quebec will be given more autonomy over immigration if the federal Conservatives win October's election, party leader Andrew Scheer promised Monday. But he wouldn't say whether he agrees that Quebec alone should determine how many immigrants it receives. Premier Francois Legault campaigned on a promise to temporarily reduce annual immigration to Quebec, beginning this year. But almost one month into the new year, Prime Minister Justin Trudeau -- an advocate of increased immigration to Canada -- hasn't said whether his Liberal government will help Quebec reach its goal. Trudeau has said he is willing to continue discussions with Legault over his immigration demands, but he stresses his priority is to ensure Quebec has enough workers to fill widespread labour shortages across the province. 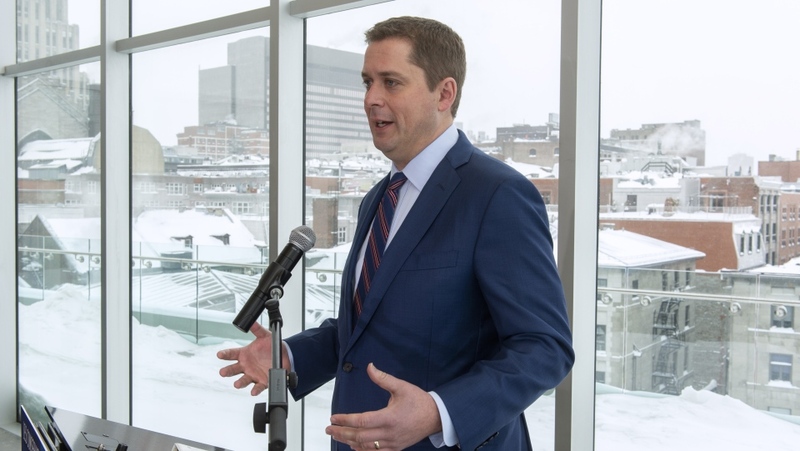 Speaking in Montreal at the end of a months-long consultation aimed at courting Quebec voters, Scheer promised "to ensure that Quebec has more autonomy" over immigration. "Trudeau has had months to do something about (immigration), and what I'm saying is that come October, when I sit down with Mr. Legault, we will actually have actions and not just words, and not just meetings for the sake of meetings," Scheer told reporters. Legault says he's concerned too many immigrants fail to learn French or leave the province soon after arriving. The premier, elected Oct. 1, wants to reduce immigration to address those issues. Immigration has become a particularly sensitive topic in Quebec since 2017, when an influx of asylum seekers entering the province illegally from the United States began. Last year alone, 18,518 out of 19,419 -- or 95 per cent -- of RCMP interceptions of migrants crossing between official ports of entry occurred in Quebec. Scheer said Canadians' concerns over immigration "stem from the fact this government has completely lost control of the immigration file. We see a situation in Quebec where over 30,000 people have entered Canada illegally and the government -- Justin Trudeau -- has literally done nothing to stop that." Quebec controls roughly 70 per cent of immigrants who settle in the province every year, all in the economic migrant category. The remaining 30 per cent arrive through the family re-unification system or as refugees, two categories controlled by the federal government. Legault has stated he wants to reduce by 20 per cent the number of immigrants in all three categories. Scheer on Monday declined to say whether he thinks Quebec should control all three categories of immigrants to the province. "I think if you have the right approach ... you don't need to have one party and one level dictating to the other. You work together in collaboration, understanding that Quebec has specific challenges, specific needs." Federal Intergovernmental Affairs Minister Dominic LeBlanc said last week he and other federal ministers will soon be meeting with their Quebec counterparts to discuss Legault's plan to reduce immigration. But LeBlanc said that discussion will have to be "in the context of a broader discussion around labour shortages and ΓÇª around asylum seekers and the appropriate compensation that the government of Quebec requires." The Conservatives sense an opening in the province due to turmoil inside the Bloc Quebecois. The sovereigntist party that once dominated federal politics in the province has been reduced to 10 MPs and last week elected a new leader, Yves-Francois Blanchet, by acclamation. Last March, Scheer wrote an open letter to Quebecers in La Presse inviting people upset with the "incompetence" of Trudeau and tired of the "existential crises" of the Bloc to come over to his party. An aide said Monday Scheer is taking French lessons, and the Tory leader's increased ease with the language was noticeable at the news conference. Aside from promising more autonomy over immigration, Scheer said a Tory government would agree to Legault's demand that Quebecers file a single tax return to be overseen by the Quebec government. The Tory leader also promised to "offer incentives" to retirees who want to re-enter the work force, in order to help alleviate labour shortages. 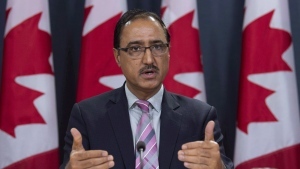 And he said a Conservative government would invest in infrastructure to prevent wastewater discharges into the St. Lawrence River and appoint a federal minister from Quebec to oversee economic development in the province. Later on Monday Scheer was scheduled to attend an event at the campaign office for his candidate, Jasmine Louras, who is vying to replace former NDP leader Tom Mulcair in a Feb. 25 byelection in the Montreal riding of Outremont.